A family run business, serving the NHS since 1994, CHAT aims to care for our customers with the highest level of service possible. We employ approximately 65 people from the greater Belfast area and beyond. At CHAT, we pride ourselves on our coffee. We focused on sourcing the best equipment that produces a great tasting product and training for staff to make it perfectly for our customers. We enjoy working alongside Specialist Beverages, who support us in delivering great tasting coffee to our customers. The coffee is complimented by our carefully chosen, local tray bakes, hot food and confectionery. We cater for a full range of dietary requirements and aim to provide something different for our customers. Our newsagent provides everything that you could need, making things as easy as possible for our customers. Where we can, we prefer to use the best local produce, we’re proud to be trading partners with local bakery French Village and local fresh food suppliers Around Noon Sandwiches. Due to the popularity of our business, the NHS awarded us a contract to supply food and beverages in their new Cancer Centre complex in 2006. We have loved providing food and beverages services to Cancer centre staff, patients and visitors over the last 10 years. We also support 2 hospital charity's throughout the year, 'Friends of the Cancer Centre' and 'Association of Friends'. The staff volunteer with various fundraising events, provide continuous support with charitable boxes and yearly private donations. Call into our Newsagents, and pick up one of our Chat gift cards, they can be used in any of our shops and cafes and make a great gift for anyone who loves a good cup of coffee! We want to show our appreciation for all the good work the staff at the Belfast Health and Social Care Trust do every day by offering a 10% discount on all hot drinks with new exclusive offers and discounts throughout the year. 10% off all hot beverages in our coffee bar, cafe and from our express coffee machine. 50% off the Belfast Telegraph & Sunday Life Newspapers. Add Money to your card to spend in any of our Cafes, Coffee Bars & Newsagents. New exclusive offers and discounts throughout the year. Application forms are available at any of our till points, simply fill in your details and one of our helpful staff members will register your card there and then. As these cards are only available to members of the Belfast Health and Social Care Trust we would kindly ask that you bring your Trust ID card with you so that we can verify that you are a member of the trust. 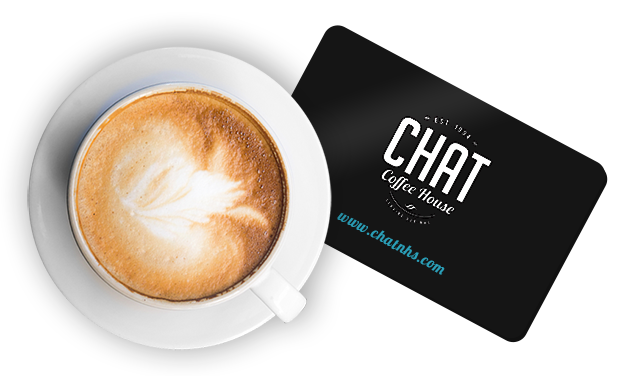 Please Note: By Signing up for your Chat Discount Card you are permitting Chat Coffee House and Newsagents to send you Information that is relevant to the use of the Discount Card as well as updates and offers from Chat. We have positions available across our two sites. Our vibrant team is dedicated to providing NHS patients, visitors and staff with outstanding customer service along with expertly crafted coffee and locally sourced sandwiches and bakery. A minimum of 1 years’ recent coffee, food or retail experience.